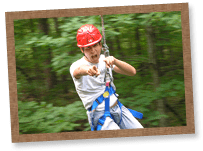 You get to pick the activities you want! You may have as many as 6 choices during the day. The facilities, equipment and leadership are there to support daily participation in the activities chosen. Instruction for all ages and experience levels is modeled after national advancement programs unique to that sport. Rest assured, with additional activities in the evening, the action continues from sunup to sundown. Use your incredible imagination and creativity! Arts & crafts, photography, model rocketry and Indian lore top the list. 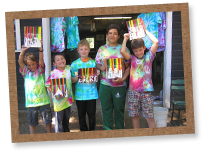 With enthusiastic instruction and encouragement to explore their artistic side, campers create their own works of art through a variety of creative mediums. 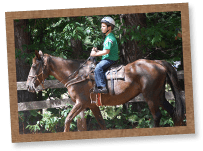 The horseback-riding program offers high-quality instruction that centers around fundamental riding skills, safety practices, and overall enjoyment. Campers of all skill levels, from the novice to the accomplished equestrian, will find tailored opportunities to build both their skills and confidence as they progress through the program. You can excel in marksmanship! Archery, riflery, and trap shooting follow national advancement programs. 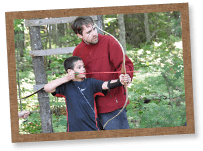 Target shooting has been a popular activity since the early days of the camps. You will develop skill and discipline in these Olympic sports. Hitting the bulls-eye is the ultimate goal! Campers are intrigued by beautiful, abundant wildlife in the Wisconsin Northwoods. 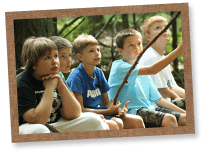 Everyone gets a chance to go on an overnight camping trip – can you say s’mores? – and sleep outdoors in a tent. Every camper is a playwright, a director, an actor, a singer and a comedian. We give campers the stage, the props, and the encouragement to develop their own theatrical productions. 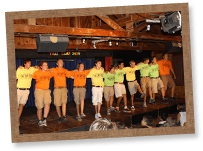 Creativity and fun are the only rules, as campers exercise their imagination with others as part of a performance troupe. One of our most popular activities! 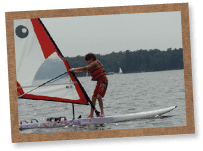 Our fleet consists of X-class trainers, Hobie Catamarans, Windsurfers and Mini-fish. 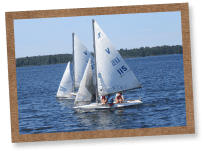 The variety of boats allows for a thorough introduction to, and advancement in, the world of sailing. Lake Nakomis is ideal for sailing! Sports build camp spirit and we have it! Be a part of a team in soccer, basketball, volleyball or baseball. Learning to work together to achieve a common goal is the most important aspect of each game. Everyone who participates is the most valuable player! The waterfront is one of the best places to be at camp, especially on warm summer days! Perfect your strokes in instructional swimming and/or take time out for play in recreational swim. The swimming area has designated sections for campers based on their swimming ability. Tennis is a sport that you can play throughout your lifetime. 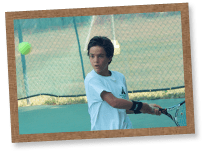 A camper’s love for the sport can start right here with our United States Tennis Association (USTA) advancement program designed for all ages and skill levels. Campers practice on outdoor finished courts. 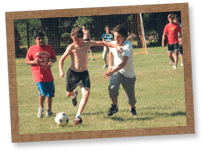 A summer at camp in itself is a great way to prevent learning loss while away from school! Should your camper need to brush up on some specific coursework, we have skilled staff to tutor children in most school subjects. Contact us to find out more about our tutoring program. There’s more than swimming at the waterfront! 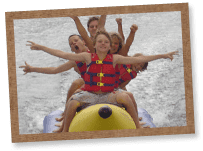 Water-skiing, knee boarding, tubing, wakeboarding, canoeing, skin diving snorkeling, fishing, water volleyball and rowing.